Wood fences are undeniably popular with homeowners. They’re versatile and are naturally beautiful. Wood fences are available in quite a few different types of woods including Pine, Fir, Spruce, Cypress and Redwood. 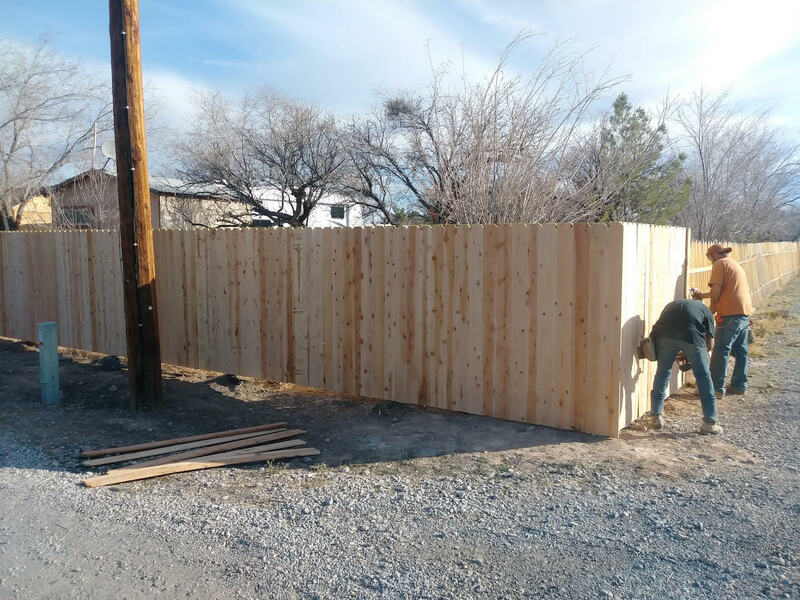 We tend to recommend cedar for most southern Nevada installations, including our most recent Pahrump Cedar fence install. We live in the desert. Cedar contains natural oils and chemicals that bugs just do not like. Cedar repels termites, cockroaches, cloth-eating moths, carpet beetles and certain ants. That’s why, as gorgeous as Redwood or any other stained wood is, we never recommend them for our customers. Termites would eat that stuff right up. One of the things I always like to remind my customers is that we live in the desert. The thermometer regularly hovers in the triple digits and driving down State Road 160 feels like being on the set of one of Clint Eastwood’s early spaghetti westerns. To be accurate, it’s not so much that I need to remind my customers that we are in the desert. Rather I caution them that many of the people giving advice online are very much not in the desert. Probably sound advice if you live in Florida. But Pahrump isn’t in Florida so it’s pretty useless around here. 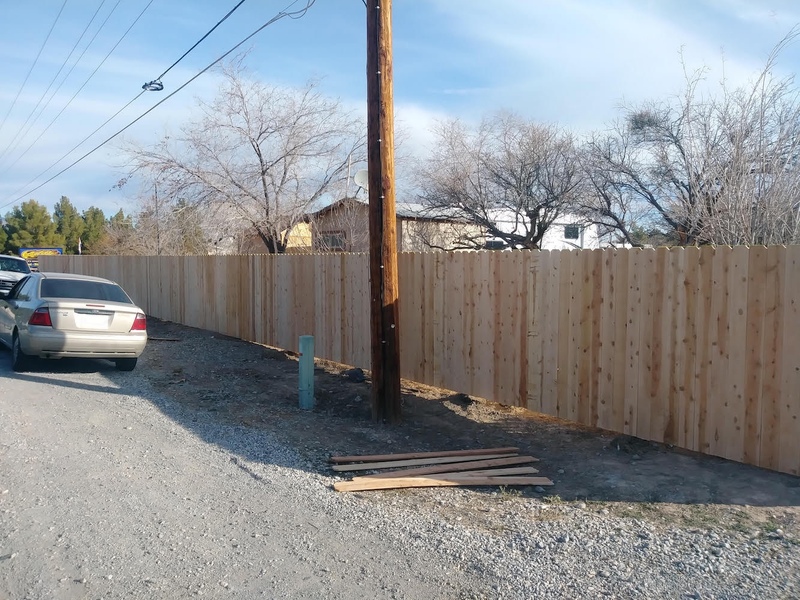 His specific Pahrump cedar fence install followed our best practice. Cedar for the panels and pressure treated for the supports. Our customer is ecstatic with his new fence. Pahrump isn’t the largest town in Las Vegas. It’s possible he also enjoyed a little local celebrity status. Many of his neighbors drove by during construction admiring and commenting on his new fence. Needless to say, if Mr. Hurley is happy, then we’re happy. Should a Cedar Fence Be Sealed? A common question we get during installations is “Does Cedar fence need to be sealed?” This confusion comes from cedar’s misconception as being some sort of super wood. That, since it repels insects so well, it shouldn’t need to be treated in any way. While it does naturally stand up to the elements better than many other wood fencing materials, even cedar needs help being better. Whether you’re in Pahrump, NV or any other corner of the Las Vegas valley you should seriously consider sealing your fence if you want it to last as long as possible. I recommend a two step application of Thompson’s Water Seal for all of my cedar fence customers. Step one is to seal the fence right after it’s installed. Step two happens one year later when you seal it again. This two step process is the best way to ensure that your cedar fence will last for a very long time. There’s a lot of variation in fencing prices between local fence companies and wood fence contractors. Our origins are in fence repair, so we always begin with a simple question. Can it be repaired or does it need to be replaced. As was the case with Mr. Hurley’s tired fence, sometimes replacement is the correct solution. Our process enables A1 Fence and Gate Repair to provide an unmatched value in the Pahrump, Las Vegas area. 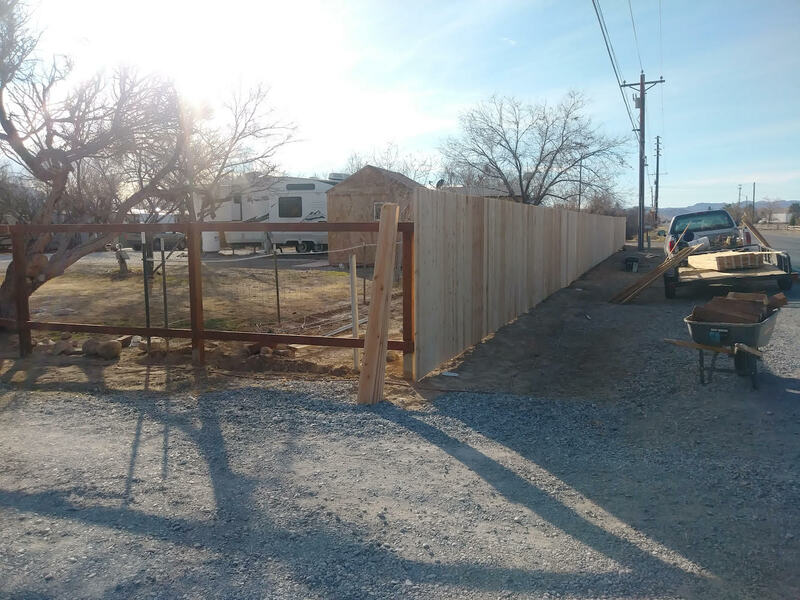 Give us a call the next time you’re considering a Pahrump Cedar fence install or any other fencing project. We’ll never sell you a repair don’t need or try to talk you into more of an install than you want.